Music is seen at different times and by different people in different cultures as different things. Working so intensely with the ancient Northern European traditions, I am more and more interested in the idea of music as architecture. In earlier medieval and back through to classical times, music was seen as part of the quadrivium, the four mathematical or scientific subjects that formed the major part of a liberal education. The placing of music as a mathematical discipline alongside geometry, astronomy and arithmetic highlights the importance of number, ratio, and structural understanding in the ancient conception of what music truly was. Vitruvius in his treatise points out how architecture depends on many other subjects, including geometry and music, to provide its essential numeric and structural grounding. But interestingly, he also says that an architect needs to know other subjects such as law, more humane subjects that we would now associate more with the emotional and expressive needs of musical creativity. 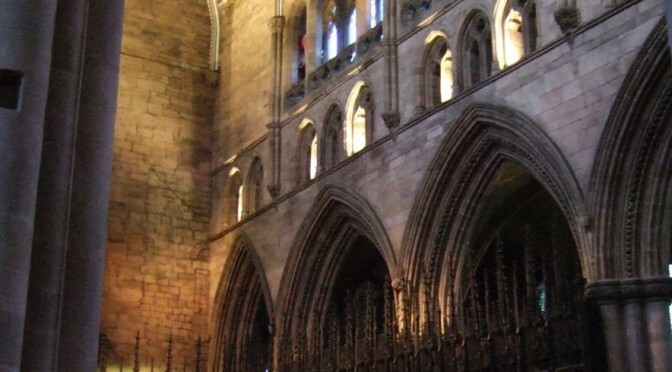 I would think that this gives us a clue as to how music and architecture are related. I see both as being first and foremost arts which create formal public spaces, which provide an environment for a person to be in. And being created environments, both a building and a musical performance are expected to be artificial, displaying their artifice, rather than natural and organic. Hence the rigid squareness and geometric layout of formal buildings. Yet, as Vitruvious is keen to point out, architecture must be rooted in natural forms, but I think this is more concerned with the supposedly natural nature of simple harmonic numbers, which are also found as the basis of ancient musical thought, scales and tunings. 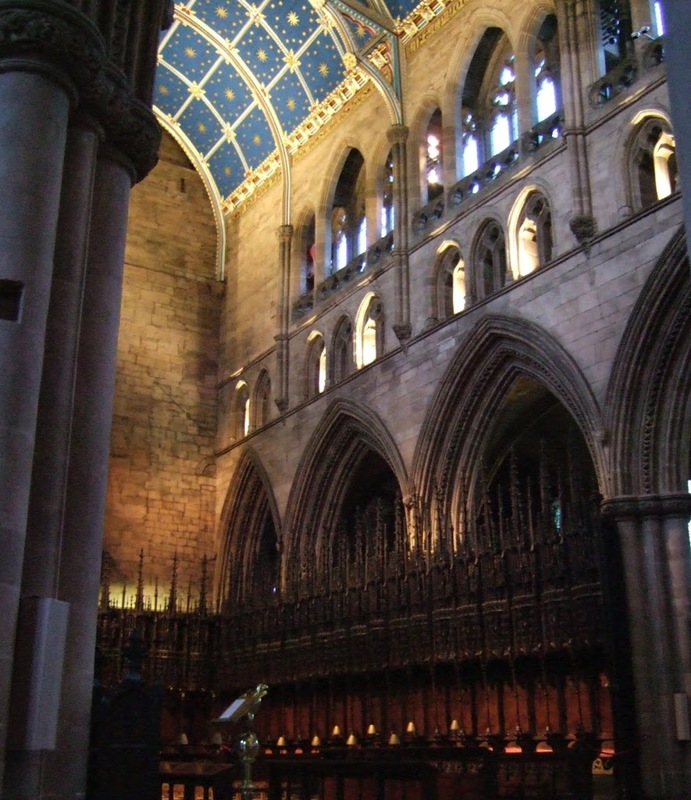 I have often held up Caniad San Silin as a great example of a piece of medieval music that is gloriously architectural in its form. With 12 major divisions, grouped into four sets of three, each division having three sections, each section having four phrases, and with the four-fold sonorities of I O I I repeating, fractal-like, at every level, the conceptual basis of this music seems to me to be less like the intricate winding of an early medieval carpet page from one of the illuminated gospel books, and more like a cathedral (see the photo above of Carlisle cathedral, with its superimposed rows of arches upon arches from the wooden choir stalls up to the gilded ceiling). So, if this kind of music is considered in architectural terms, what principles can we consider to help with performance and creativity? Well, one thing that seems interesting is the idea of a building having multiple uses and functions. It has to be formally beautiful and well proportioned, so as to be appreciated in detail as an art object, withstanding and rewarding close and intense scrutiny. But it also has to be a practical place for humans to be in whilst they do other business, in other words it has to provide a discreet, ergonomic ambience. This to my mind parallels music’s dual function as a focussed and concentrated art form as well as providing a background hum for distracted activity. The other thing that buildings have to have, according to Vitruvius, is permanence, continuing solidity through time. Now this is the exact opposite of music, which by its very nature emphasises the transience of time and experience. But I am wondering if a single, unique musical performance can somehow express that timeless permanence through the memories of the people who listened to it. 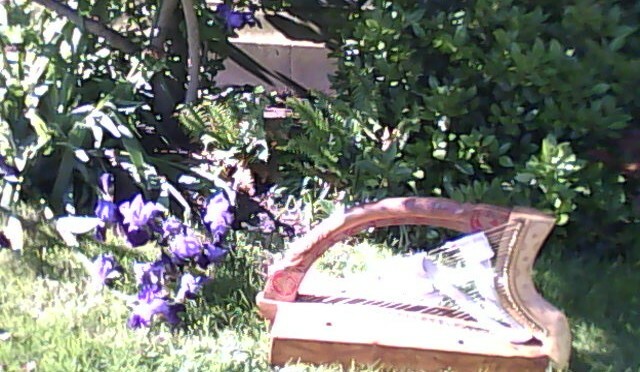 And if it can, does the concept of a “piece” of music have any part to play in this, or is it a hinderance instead? 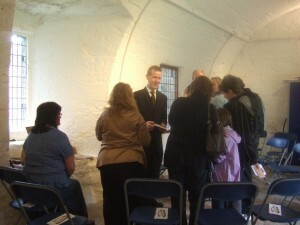 Here is a photo from today’s concert in St Andrews cathedral ruins. There was much interest from the audience in the three instruments I played today – the replica Queen Mary clarsach, the lyre with iron, brass and silver strings and fitted with the replica Iron-age bridge from Uamh an Ard Achaidh, and most of all the jouhikko. In this photo I am showing off the facsimile of the St Andrews music book, the 13th century manuscript that originally belonged to the cathedral, and which contains a huge amount of early polyphonic liturgical music. Yesterday I played for a wedding in St Salvator’s chapel here in St Andrews. 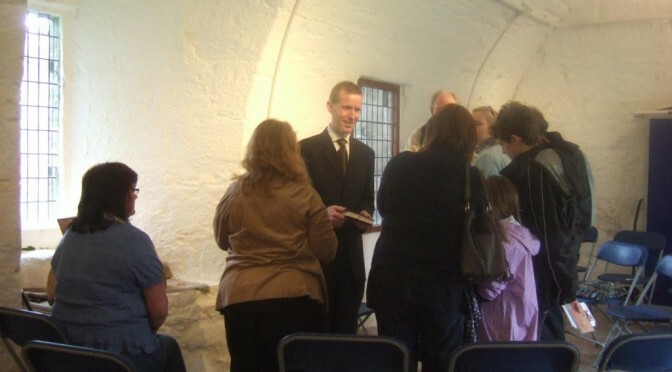 My main role was to play the medieval Scottish wedding march “Ex Te Lux Oritur” for the formal entrance procession of the wedding party, which was I think a great success. There was some excellent trumpet and organ music played by Bede Williams and Tom Wilkinson during the ceremony as well. I had to slip out before the end (not easy to do this discretely) as I was also a part of the band of bellringers, ringing the chapel bells as the wedding party left the chapel at the end of the ceremony. 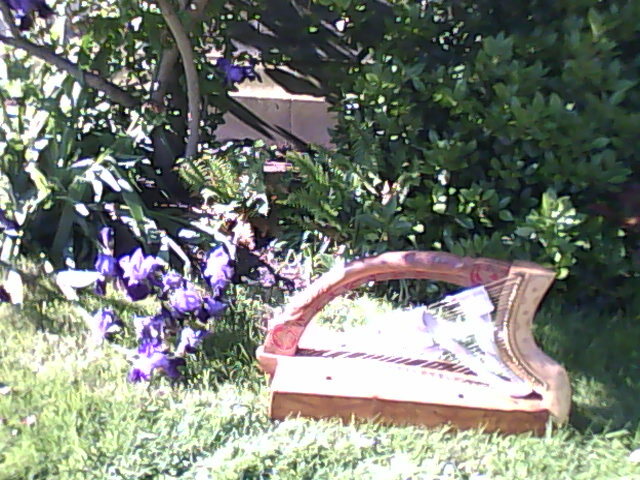 I think this is the first time I have played harp music as well as rung the bells at one wedding before. The weather was pleasantly sunny and so everyone gathered on the University quad lawn for champagne, and I played background music for as long as there were people listening. 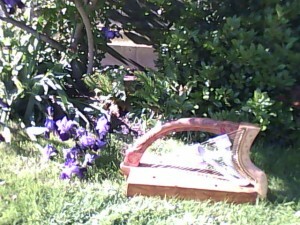 The photo below shows the harp resting in the sunlight beside the gardens where I was playing.